In September 1939, the Germans established the Stutthof camp in a wooded area west of Stutthof (Sztutowo), a town about 22 miles east of Danzig (Gdansk). The area was secluded: to the north was the Bay of Danzig, to the east the Vistula Bay, and to the west the Vistula River. The land was very wet, almost at sea level. The camp was situated along the Danzig-Elbing highway on the way to the popular Baltic Sea resort town of Krynica Morska. Originally, Stutthof was a civilian internment camp under the Danzig police chief. In November 1941, it became a "labor education" camp, administered by the German Security Police. Finally, in January 1942, Stutthof became a regular concentration camp. 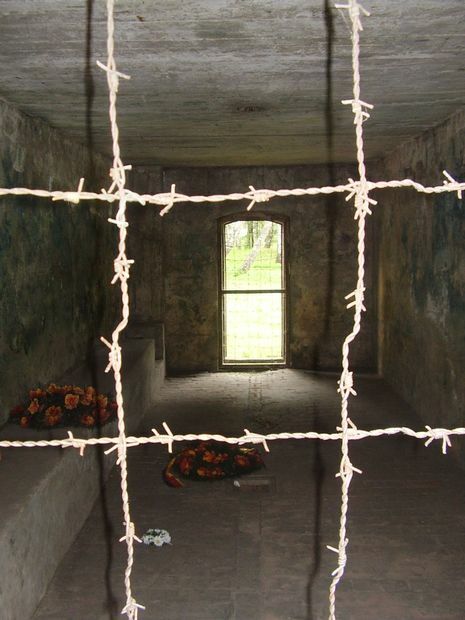 Stutthof was the first concentration camp built by the Nazi Germany regime outside of Germany. Completed on September 2, 1939, it was located in a secluded, wet, and wooded area west of the small town of Sztutowo (German: Stutthof). The town is located in the former territory of the Free City of Danzig, 34 km east of Gdańsk, Poland. Stutthof was the last camp liberated by the Allies, on May 9, 1945. More than 85,000 victims died in the camp out of as many as 110,000 people deported there. 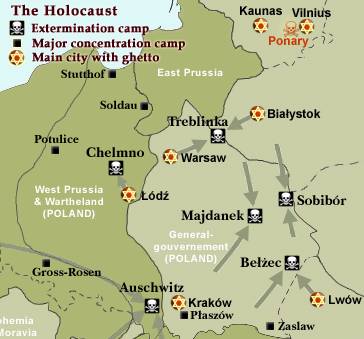 The Nazi authorities of the Free City of Danzig were compiling material about known Jews and Polish intelligentsia as early as 1936 and were also reviewing suitable places to build concentration camps in their area. Originally, Stutthof was a civilian internment camp under the Danzig police chief. In November 1941, it became a "labor education" camp, administered by the German Security Police. Finally, in January 1942, Stutthof became a regular concentration camp. The original camp (known as the old camp) was surrounded by barbed-wire fence. It comprised eight barracks for the inmates and a "kommandantur" for the SS guards, totalling 120,000 m². In 1943, the camp was enlarged and a new camp was constructed alongside the earlier one. It was also surrounded by electrified barbed-wire fence and contained thirty new barracks, raising the total area to 1.2 km². The camp staff consisted of SS guards and after 1943, Ukrainian auxiliaries. In 1942 the first female prisoners and German guardesses arrived in Stutthof, including aufseherin Herta Bothe. A total of over 130 women served in the Stutthof complex of camps. 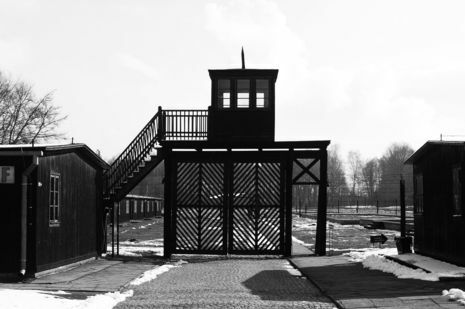 34 female guards, including Gerda Steinhoff, Rosy Suess, Ewa Paradies and Jenny-Wanda Barkmann, have been identified later as having committed crimes against humanity at Stutthof. Starting in June 1944, the SS in Stutthof began conscripting women from Danzig and the surrounding cities to train as camp guardesses because of a severe guard shortage. 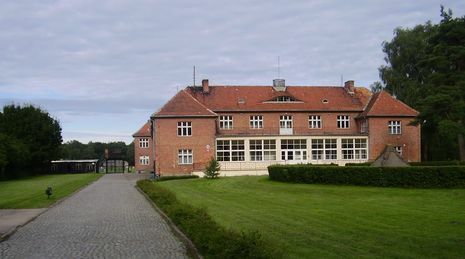 In 1944 a female subcamp of Stutthof called Bromberg-Ost (Konzentrationslager Bromberg-Ost) was set up in the city of Bydgoszcz. A crematory and gas chamber were added in 1943, just in time to start mass executions when Stutthof was included in the "Final Solution" in June 1944. Mobile gas wagons were also used to complement the maximum capacity of the gas chamber (150 people per execution) when needed.